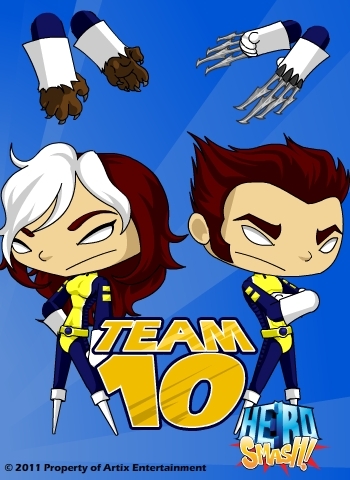 The uncanny force of Team 10 has arrived at the Market St Movie Mega Plex (*whew* That's a lot of M's). There are armor, items, and hair styles for you to make yourself one of the elite. Also pick up some new powers. For the first time HeroSmash will be offering POWERS that will become perma-rare! What power will best suit you? Is it the Phoenix Fire, Magnetism, Foresight, Animal Fury, or Claw Fighter? * We made a big round of bug, and map fixes. * We also included the ability to see lost cutscenes through your HALdroid. Simply open your MISSION app, access the MISSION tab and find the mission that had the cutscene you were looking to re-see. * Also included in the HALdroid is the new Artix Point Redemtion app. Now you can easily purchase and redeem artix points through the HALdroid. How cool is that!